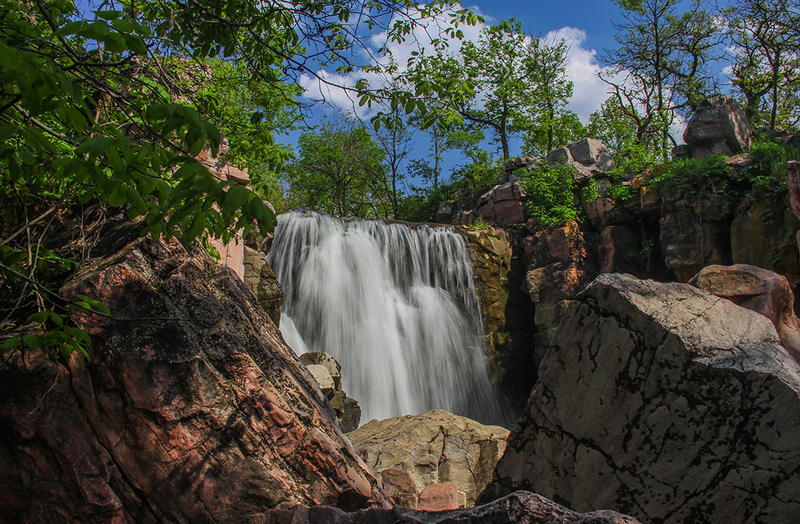 Winnewissa Falls is situated amid the pipestone quarries at Pipestone National Monument. The falls, along with the surrounding quarries, are considered sacred by many American Indians. Our journey to Winnewissa Falls began on a rainy Saturday morning in June. With umbrellas in hand, we first headed up to the visitor center, which houses the Upper Midwest Indian Cultural Center. It’s home to a gift shop, museum exhibits, a bookstore, and a 22-minute film. The quarries here have produced pipestone (also known as Catlinite) for thousands of years. The soft, malleable stone is used in ceremonial objects, especially pipes. Quarrying is limited to American Indians, but, during the summer months, American Indians sometimes lead cultural demonstrations where visitors can see pipestone carving in progress. When you are ready to head to the waterfall, grab a trail map. You’ll want to plan on a good hour for the 0.75-mile nature walk, which is known as the circle tour. 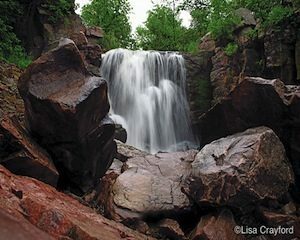 On the paved trail, you’ll stroll through the native tall-grass prairie and the pipestone quarries. You’ll also pass by unique quartzite rock formations, such as Leaping Rock and Old Stone Face, as well as trail markers discussing the history of the area. You’ll then pass over Pipestone Creek; about halfway in, you’ll start to hear the falls. With the rocky creek in the foreground and the waterfall in the background, there are great photo opportunities along the way. As you near the falls, you can walk in front of them for great shots, and you can also climb up the chiseled stone steps around the falls. Because it was lightly raining on our visit, we had to be careful to avoid falling, but I’m actually glad everything was wet. It gave the red rocks added texture, and the images looked so much richer. After visiting the falls, you’ll walk through some more of the interesting quarries as you circle back to the visitor center.